Our Leader. Our Friend. Our Inspiration. Jim took the reins of our struggling nonprofit [then known as The Partnership for a Drug-Free America] and put us on a trajectory of enhancement and expansion, which has defined us for a quarter century. There are so many wonderful things we can say about Jim Burke – a man whose passion for serving people in need, abiding commitment to ethical behavior and relentless demand for truth and excellence created the foundation by which the Partnership for Drug-Free Kids stands on today. Jim was truly masterful at bringing out the best in those around him – helping alleviate pressure by changing insurmountable challenges into surmountable bumps in the road. His inherent belief that serving the needs of the individual are the key to a successful business. This elevated him far above his counterparts. While inarguably a demanding leader, Jim’s warm, personal approach and his ability to deal with people in a way that put them at ease, while eliciting their most enthusiastic and best work, created a family atmosphere at The Partnership. His work ethic has served as the ideal human framework for the pursuit of our vision – a world where all young people can live their lives free of drug and alcohol abuse. Jim’s influence on The Partnership is indelible and, despite his passing, his spirit will remain to further rally and inspire us, and cheer us on through those surmountable bumps we may face in the future. It is no surprise that Fortune Magazine named Jim Burke one of the 10 Greatest CEO’s of all time and that he was awarded the highest civilian honor in the nation –The Presidential Medal of Freedom. During his remarkable career, he made unique contributions to his country, and to Johnson & Johnson, where he spent 37 years and became one of the nation’s best known and most admired chairmen and chief executive officers. As Chairman of The Partnership, Jim made even more profound contributions, this time to the prevention and treatment of addiction, and to the health and well-being of the U.S. population, especially of children and families. 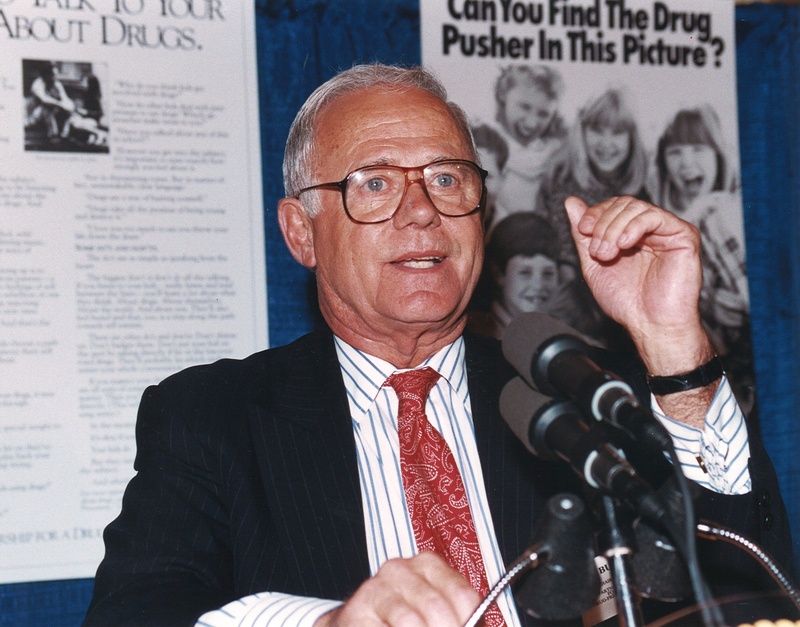 When he became our Chairman in 1989, his challenge was to reach more people, with compelling, researched-based, drug education messages about the dangers of illegal drugs. Jim made a staunch commitment that we would achieve $1 million dollars a day in donated media value for those messages across all forms of media. His leadership galvanized support from every facet of the communications industry, and in a little over a year, that seemingly impossible goal was achieved as only Jim could have done it. The Partnership’s public service campaign went on to become the largest national public service media campaign in U.S. history. As a board member of The Robert Wood Johnson Foundation (RWJF), Jim was instrumental in convincing RWJF of the significant need to improve the health of Americans by reducing the impact of substance abuse on families and communities. RWJF adopted the reduction of substance abuse as one of only three of its primary areas of focus, and as a result, hundreds of millions of dollars in grants funded health research efforts, bolstered cutting-edge programs in prevention and treatment, and supported extended recovery for those struggling with addiction. From the time Jim Burke became actively involved with The Partnership to present day, 1/3 fewer Americans are now using illegal drugs and far fewer are becoming addicted. This extraordinary public health success was made possible by the work of millions of dedicated people, but it likely would not have been possible without the vision and commitment of Jim Burke. He was the loudest, most persistent voice for the under-recognized issue of substance abuse and the critical investment in reducing its impact on the U.S. and especially on the children and families he held so dear. To know Jim was to love him, and his big personality was only matched by his unique sense of humor, especially as it played out in his interactions with his executive assistant. The singular legacy of Jim Burke at The Partnership, along with his brother Daniel B. Burke and the entire Burke Family, is marked by enduring integrity, generosity, compassion and a steadfast dedication to making a measureable difference in the lives of others. Theirs is a peerless story of individual leadership, corporate citizenship and deep human caring. No family has been of greater significance to our ongoing mission and accomplishments in helping solve the problems of substance abuse and addiction than the Burke family – and those tireless efforts were led by Jim Burke. Jim, our friend, you will be dearly missed, fondly remembered and never forgotten. ***Donations can be made in memory of Jim Burke at drugfree.org. So many lives saved and youth drug use prevented and reduced thanks to the extraordinary leadership of Jim Burke. What an honor to have worked for the national Partnership, a magical organization that does great work every day thanks to its leaders. Wishing the Burke family peace at this difficult time.